Prepositions and prepositional constructions constitute an integral part of Present Day English and play a fundamental role in its system of verbal complementation: Not only are they used to express adverbials of instrument, location or time (John wrote the letter with a pencil in Rome on Monday), but PPs also frequently mark the direct or indirect objects of verbs (John relied on this mother to give the book to Mary). Accordingly, their semantic and syntactic features have received much attention in the literature. Nevertheless, there is still considerable disagreement as to the precise analysis and classification of the range of prepositional patterns available today. The historical development of prepositions in verbal complementation is particularly interesting, as they saw a great deal of change over time: they have dramatically increased in frequency from the 12th century onwards, and are coming to fulfil more and more functions. Changes in progress can be observed in certain varieties of English as a Second Language, in which prepositional patterns are even more frequent than in Standard English. In short, the English language appears to have become ever more ‘preposition-friendly’. Although the diachrony of prepositional structures has been dealt with extensively in previous research, a systematic, comprehensive and unified account of their development and spread is still lacking. 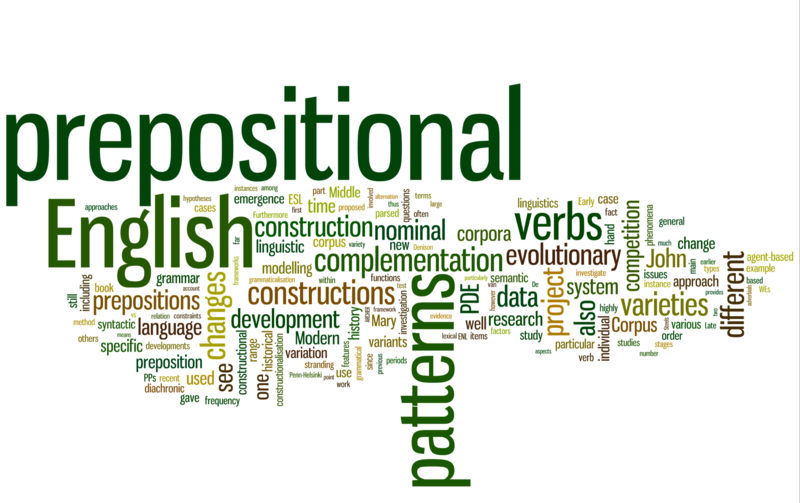 Instead of focussing on individual aspects connected to the diachronic development of PPs, or single periods in time, as existing studies have typically done, the proposed project aims to provide a comprehensive treatment of the history of English verb complementation from the perspective of prepositions. It combines the range of sub-developments which took place at different points in time, and reaches a new historical depth by including data from Middle English to Present Day English. Crucially, the project also relates the study of historical English linguistics to the field of World Englishes, comparing and contrasting changes in earlier stages of the language with recent and ongoing change, thus providing a novel link and perspective. By doing so, we seek to offer a fuller picture of prepositional complementation in English and to find diachronic explanations for synchronic, contemporary phenomena. Specific issues to be investigated include grammatical and lexical constructionalisation in the case of prepositional complementation, system dependency, as well as competition with nominal patterns. In addition to being much broader in scope than earlier work, the project overcomes the limitations of previous studies which were based on very small datasets by using data from large historical and syntactically annotated corpora. The corpus-based approach is furthermore supplemented by evidence from mathematical modelling, specifically agent-based models. On a theoretical level, our approach is grounded in the state-of-the-art frameworks of (diachronic) construction grammar and evolutionary linguistics. By readdressing long-standing questions in English diachronic and synchronic syntax from a novel and original perspective, the project will contribute greatly to the field of language variation and change in and beyond English.